Since our beginning in 1928, James River Transportation has partnered with churches. Our Chairman, Woody Story, used to pick up local students in a bus and take them to church each Sunday morning. 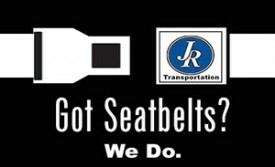 Dedication to Safety – seat belts on all buses, driving simulator, extensive driver background checks. The values that guide our organization – Customer Service, Safety, Reliability, Integrity and Teamwork. And our long standing support to the community.